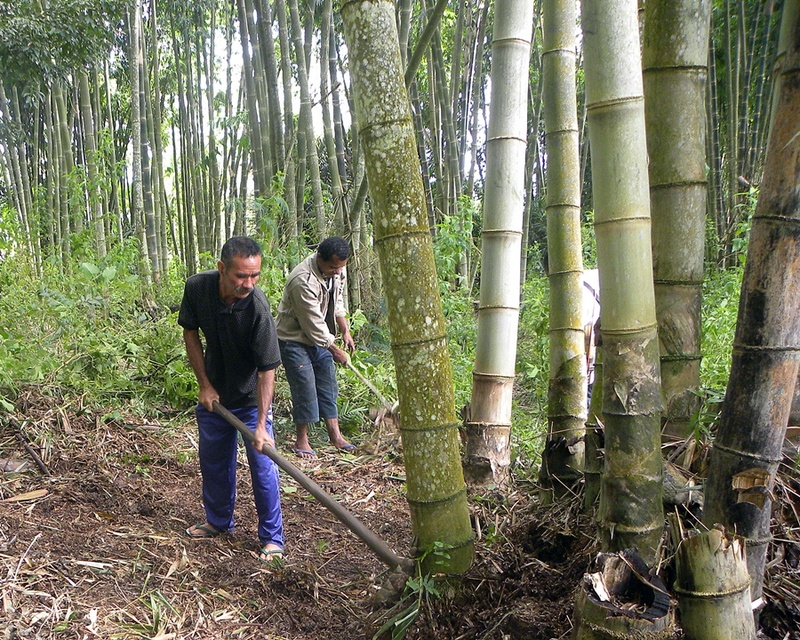 The Indonesian bamboo industry is underdeveloped and missing opportunities. More support is needed. Despite a significant contribution to the economy, the bamboo industry in Indonesia remains underdeveloped. In terms of policy, bamboo is also often overlooked, with most attention focused on timber. Indonesia is home to around 143 bamboo species and 2.1 million hectares of bamboo forest. For centuries, bamboo has been used for construction, housing, household items and handicrafts. It is a ‘no-fuss’ species that grows rapidly compared to timber, is highly adaptable to various types of soils, and is relatively easy to process. The industry provides livelihoods for hundreds of thousands of people. Marcellinus Utomo of the Australian National University explored ways on how the Government of Indonesia could foster the bamboo industry. He focused on bamboo value-chains in Gunung Kidul District, Yogyakarta Province as part of the Developing and Promoting Market-based Agroforestry Options and Integrated Landscape Management for Smallholder Forestry in Indonesia project, which is funded by the Australian Centre for International Agricultural Development. ‘The research findings are very valuable to us’, said project leader Aulia Perdana of the World Agroforestry Centre. ‘It will help us devise interventions, such as bamboo agroforestry systems, extension programs for silviculture, ways to better process raw material, and improve marketing and business skills. Additionally, we plan to test how to increase the scale of bamboo agroforestry to support the Thousand Bamboo Villages program’. In December 2015, the Government initiated a 10-year program, Seribu Desa Bambu (Thousand Bamboo Villages), to foster the industry by establishing bamboo forests and factories. Yet, according to the research, the results have been sub-optimal. Utomo examined the value chains of three bamboo products: durable bamboo, kitchen utensils and handicrafts. Data were collected from June to August 2016 through interviews, focus groups, a literature review and direct observations. He found that durable bamboo had the shortest chain with the least people involved, followed by kitchen utensils; the handicraft chain was the longest, involving the greatest number of people. Although people in all the value chains were typically well-informed about markets, there was limited sharing of information by buyers to sellers about prices, which could be detrimental for some in the chain, such as growers and artisans. Bamboo was still considered a cheap material. Straight bamboo with a large diameter could sell for IDR 6000–7000 per pole (≈ USD 0.50). Because of the unattractive price, farmers didn’t put in much effort, neither applying fertilizer nor using silvicultural techniques. When income from bamboo was compared with national minimum income per capita, Utomo projected that for farmers the economic contribution of bamboo handicrafts was a mere 0.6–1% of the minimum income, while kitchen utensils contributed 6.4–8.9% and durable bamboo products 7.7–13.5%. These low contributions were caused not only by cheap prices but also irregular demand. To make ends meet, farmers usually cultivated seasonal crops and rice and grew timber for savings. Artisans, who processed and added value to bamboo, gained significant income. Durable bamboo contributed 13.2–104%, to their income, kitchen utensils 152–472%, and handicrafts 169% up to an astonishing 3072%. From the numbers in the value chains, it was clear that profit were not evenly distributed. Growers were the most disadvantaged. They also lacked knowledge about bamboo management whereas artisans lacked marketing knowledge and entrepreneurial skills. Weak English-language skills further constrained artisans’ opportunities because most buyers were foreigners. Utomo also found a lack of coordination between Government bodies and limited coordination between people within chains, which restricted overall growth of the industry. He recommended the Government establish a taskforce that would operate at both national and local levels to integrate the industry within agricultural and rural development programs, lobby ministries, collaborate with NGOs and research institutions, encourage more extension services, improve promotion of handicrafts, and support better access to micro-credit. Formation of cooperatives of producers would help to build capacity and enhance bargaining positions within a chain. Utomo MMB. 2016. Value chain improvement of bamboo products for livelihood enhancement: a case study in Gunung Kidul Regency, Daerah Istimewa Yogyakarta Province, Indonesia. Thesis. Canberra, Australia: Australian National University. This work is supported by the CGIAR Research Program on Forests, Trees and Agroforestry. ICRAF The World Agroforestry Centre is one of the 15 members of the CGIAR, a global partnership for a food-secure future. We thank all donors who support research in development through their contributions to the CGIAR Fund.